After Total War Can Come Total Living, 2018, ink on unprimed, stitched and folded canvas, embroidery, felt, dimensions variable. After Total War Can Come Total Living series is inspired by US Cold War propaganda poster with the same title. Post-WWII, the greatest threat was total nuclear annihilation. In the poster we see a happy couple, a man and a woman are gazing out over a manicured suburb with above promise “After total war can come total living.” The slogan is absurd not only because it promise a “happy and worriless living” after a “total nuclear war” but consider the fact that we actually are at “the war state” (national, social or/and personal war) and “the living state” (unless it is a zombie war) at the same time. 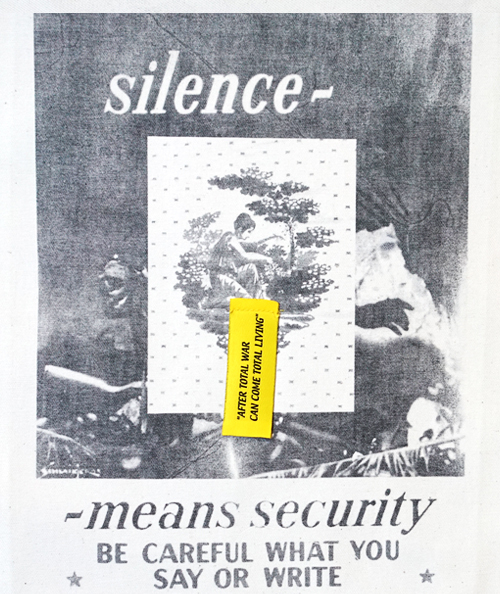 After Total War Can Come Total Living series is based on propaganda WWII, Cold and Vietnam war posters, bringing old propaganda rhetoric into todays political climate; reintroducing “The Red Menace,” reestablishing women role in the society and promoting “silence” and “say something” campaign, etc. By its very nature, propaganda distorts the truth to targets our basest impulses—fear and anger, reading propaganda ironically - maybe is only way of reading it, the fact that most of it is quite absurd helps. After Total War Can Come Total Living are ink photo-transfers on unprimed, stitched and folded canvas, attached to an industrial felt. 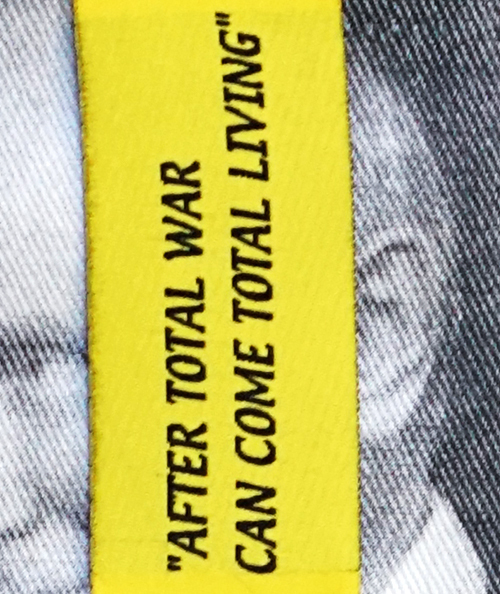 The series of 15, each has “After Total War Can Come Total Living” embroidered cloth tag.